Kale Crackers with Kale, Flaxseed, Sesame Seeds, and White Sesame Seeds. Gluten free. No sugar added - contains naturally occurring sugars. 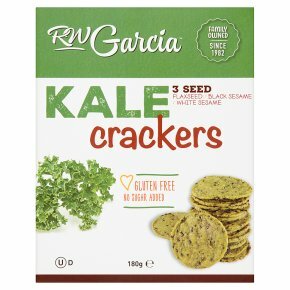 Kosher - D.RW Garcia 3 Seed Kale Crackers bring something new to the table. Great with any topping-our nutritious ingredients include Kale, stone ground white maize and a trio of seeds blended together to make a delicious gluten free cracker. Enjoy!